Check out the Condensed Game! 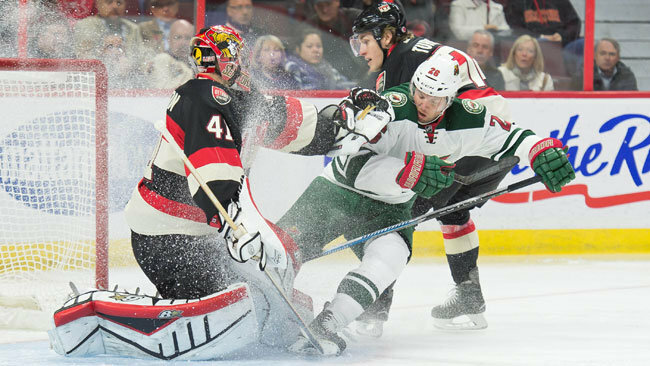 OTTAWA — An all-rookie line sparked the Ottawa Senators to a 3-0 win against the Minnesota Wild at Canadian Tire Centre on Thursday. The line of Mike Hoffman, Curtis Lazar and Mark Stone was put together by Senators coach Paul MacLean against the Chicago Blackhawks on Oct. 30. With Hoffman’s two goals against the Wild, the line has been in on at least a goal a game in the four since then. Hoffman’s second goal Thursday, his third of the season, put the Senators up 3-0, 2:06 into the third period. The Senators (7-3-2) were outshot for the 10th time this season. Goaltender Craig Anderson, playing two games in a row for the second time this season, made 35 saves for his second shutout and the 28th of his NHL career. Ottawa had 17 shots. Anderson had a big smile on his face late in the game. Minnesota held a 16-8 shots advantage in the third period. The Senators are 4-0-2 here, the only team in the NHL without a regulation loss at home. The Ottawa power play, which was held without a shot on back-to-back penalties to Minnesota in the first period, opened the scoring at 2:23 of the second. The goal by Clarke MacArthur, his team-leading seventh, came with Minnesota’s Marco Scandella serving an instigator penalty following a fight with Ottawa’s Mark Borowiecki, who was back in the lineup after missing three games because of injury. Scandella approached Borowiecki after the defenseman hit Wild forward Jason Pominville at the Minnesota blue line. The Senators power play has been showing improvement at home this season. MacArthur’s goal was their sixth at Canadian Tire Centre this season; it scored 16 goals at home last season. The goal came after the Senators were held without a shot on the power play for 5:26. The back-to-back power plays in the first period came when Minnesota defenseman Christian Folin was penalized for delay of game at 6:45 and the Wild were assessed a bench minor for too many men on the ice at 9:11. Hoffman scored a soft goal to put the Senators ahead 2-0 2:24 after MacArthur’s. Hoffman’s shot from the right-wing circle found its way through Wild goaltender Niklas Backstrom, playing in his third game of the season. Lazar played his 10th game of the season, kicking in the first year of his entry-level contract. The 19-year-old was told Wednesday by Senators management he would be staying with the team and would not be sent to the Edmonton Oil Kings of the Western Hockey League. The Wild played their first of a three-game road trip without leading scorer Zach Parise. Coach Mike Yeo said Parise is out with a concussion and will not play on the trip. Yeo said Parise wasn’t feeling well during a 4-1 loss to the Pittsburgh Penguins on Tuesday. “We don’t have a time frame for you guys here, but obviously a big blow to us,” Yeo said. Parise’s condition will be assessed when the Wild return to Minnesota after games at the Montreal Canadiens on Saturday and at the New Jersey Devils on Tuesday. “All I know is he is out for this trip, and what I would say is we probably have to get back and talk to the doctors and see from there,” Yeo said. The Wild (7-5-0) have outshot their opponent in every game this season. The Senators continue their homestand against the Winnipeg Jets on Saturday and the Toronto Maple Leafs on Sunday. The game Sunday was rescheduled from Oct. 22, the day of the shootings at Parliament Hill.